We're thrilled to see the DC community support women entrepreneurs! Over 75 organizations have applied for BEACON funding and we're currently sifting through our first-round of review. Haven't heard from us? Don't worry - we're busy screening applications with care. 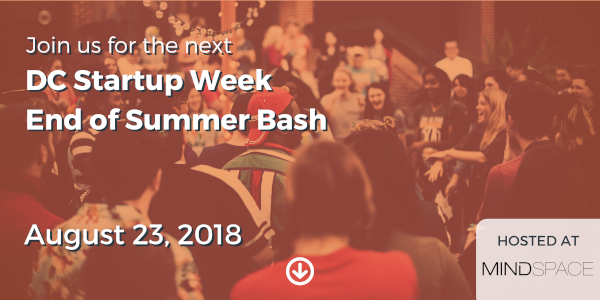 Stay tuned for updates and the start of community voting next week! BEACON Advisory Board Member Appointed as Chairperson of the National Women's Business Council. BEACON Advisory Board member, Liz Sara, was appointed as Chairperson of the National Women's Business Council. She will serve a three-year term to help ensure that women remain a vital driver of our nation's economy. Congrats, Liz! 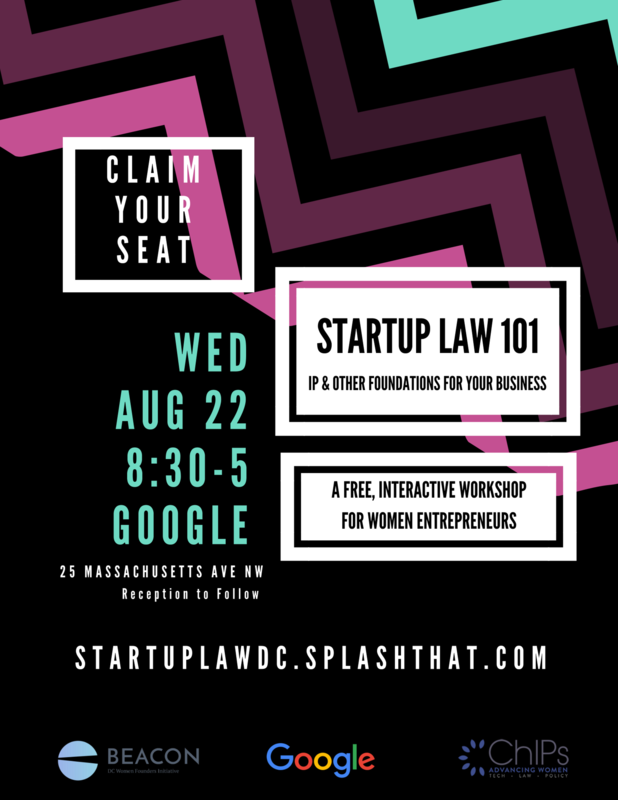 Startup Law 101 is on Aug 22 - don't miss out! Did you miss out on Startup Law 101 last year? 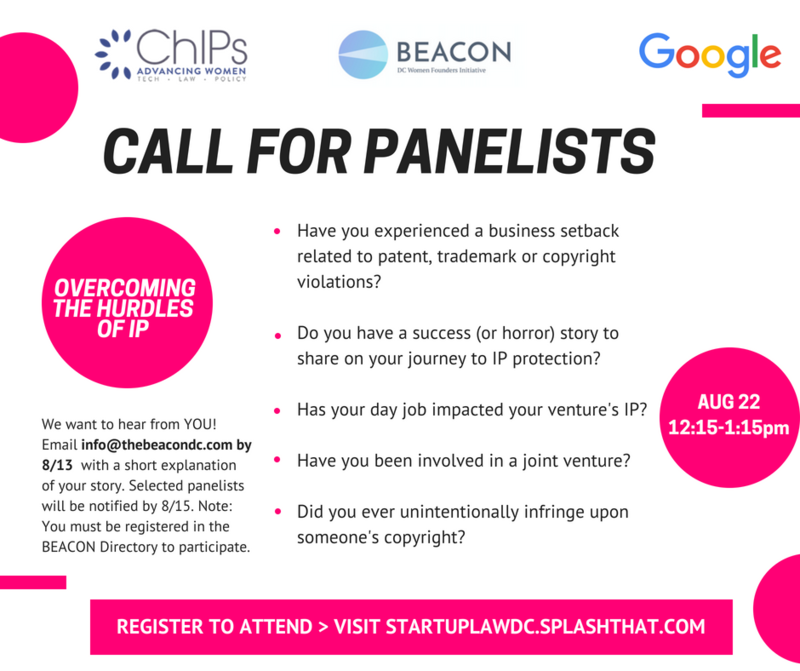 This year, we're welcoming over 100 women founders to Google's DC office for a full-day legal workshop on corporate formation, intellectual property, advertising, privacy and more! Come with your notebooks and thinking caps and save your seat before they're gone! The D.C. Women's Busines Center will accept nominations through 8/31 for the following categories: Community Engagement of the Year, Women Empowerment Entrepreneur of the Year, Womanpreneur Under 40 of the Year, Creative of the Year, Startup of the Year, Veteran Women-Owned Business of the Year, and Outstanding Resource Partner. Self-nominations are encouraged. Click here for more info. Did you hear the DC Bar's Podcast on Non-Disclosure Agreements? On the tips of Startup Law 101, we're featuring some awesome legal resources around town. Check out this helpful podcast sharing tips on non-disclosure and confidentiality agreements that are essential to your business! EnrihHER would like to share YOUR lessons, tips and entrepreneurial advice as a guest blogger on their Medium platform. Simply complete this survey and organizers will be in touch! CNBC is looking to highlight 100 technology-driven start-ups experiencing rapid growth because of their innovative products, apps, tools or services for the 2018 CNBC Upstart 100 List. Companies will be scored on a wide-range of quantitative metrics including scalability, sales and user growth, intellectual property, and more. Apply by 8/15. The AMPLIFY: Women's Pitch Competition is a must-attend startup competition for entrepreneurs, investors, engineers, and designers that explore up and coming trends in innovation, technology, and most importantly, showcases the best and brightest female tech entrepreneurs from around the world. Apply with your women-led, tech startup to receive a cash prize and additional resources. Apply by 8/15. 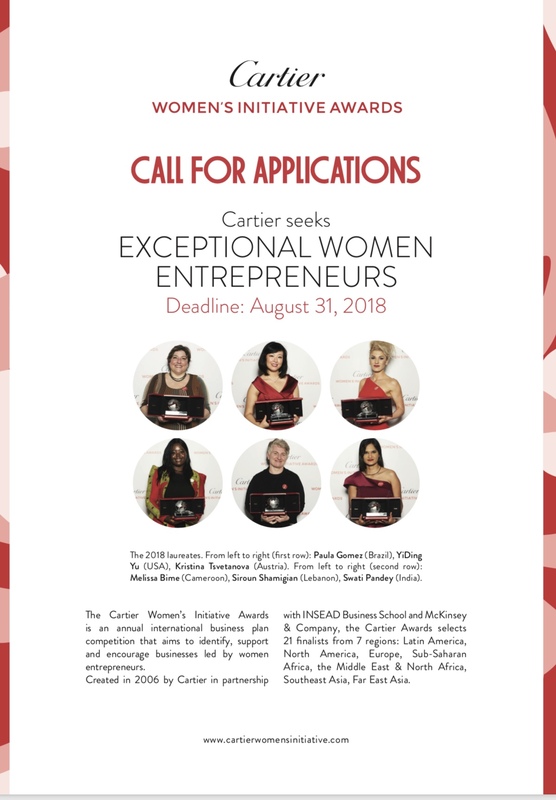 The Cartier Women's Initiative Awards is an international business plan competition created to identify, support and encourage projects led by women entrepreneurs. The awards aim to encourage inspirational women entrepreneurs worldwide to solve contemporary global challenges by supporting and recognizing creative women who are making concrete contributions to finding solutions for the future of our planet and bringing these business solutions to the largest audience possible. Apply by 8/31. Are you interested in learning to code but wondering how you'll afford the courses?The Flatiron School and Lyft have partnered to award all female applicants an automatic 50% Women Take Tech Scholarship to Flatiron's Online Web Development Program. Learn more. 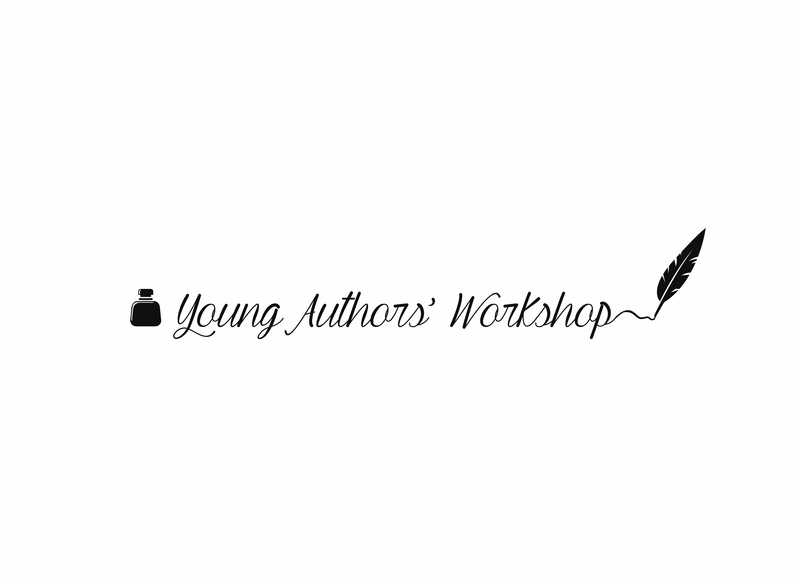 The Young Authors' Workshop was created to help elementary and middle school students engage in the editing process, ranging from group brainstorming and constructive criticism to personalized grammar instruction. The students explore fiction, non-fiction, and poetry, with the end-goal of publishing a book at the course's conclusion. The year-round program is also offered during the summer and is available for school and organizations in the District of Columbia. Founder Dieneria Brown created the Young Authors' Workshop to give students a place to express themselves, explore their imaginations, and improve their reading, writing, grammar, and public speaking skills. After receiving her B.A. in English with a Concentration in Creative Writing as well as an M.F.A in Creative Writing, Dieneria merged her passions to create the Young Authors' Workshop. The Her Corner Fall Accelerator is a six-month in-person business growth program, designed by women business owners. By participating, you'll meet for a full-day each month to discuss your business goals in collaboration with like-minded women entrepreneurs. You'll not only acquire the knowledge you need to grow your business -- from vision to cash flow analysis, from marketing to business prospecting -- but you'll also gain the confidence to accomplish your goals. Learn more and apply here.